Who does not like being “Apple-holic” ? Apple has its own speculative energy that drives us crazy with its posh looking gadgets and devices. With every passing moment we hear about a new arrival of some magnificent product with all the more improvised versions of previous ones. Every time I contemplate to myself how come this new Apple device be so “perfect”? That’s not just all whether it’s Apple Macs, iPhones or any Apple tablet; it hit other brands on the grass root level. Apple iPad mini tablet is built in ideal size colliding with extreme fine and dense quality. Nevertheless it is a blow to the other brands as per it’s performance. Apple as made me more techno and a true geek like many others. 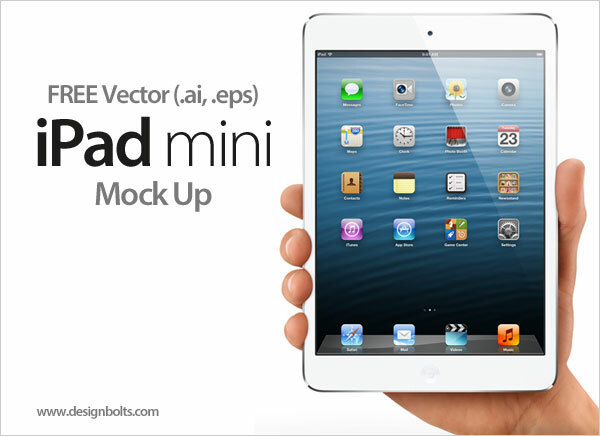 Today I am bringing along free Vector new Apple iPad mini Tablet in (.ai & .eps) format. You can use it in your designing projects up ahead or currently. Scroll down and catch the glimpse. Thanks for this…it is perfect. Appreciate the time you put into this, saving everyone else time.